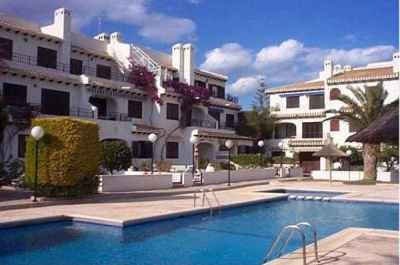 Apartment for holiday rental in the exclusive Cabo Roig region in the heart of the southern Costa Blanca. This is a small established private development overlooking a swimming pool and natural parkland with private parking and only minutes walk to the sandy blue-flag beaches of Cabo Roig. The holiday apartment has 2 bedrooms and is ideally located for both beach and golf holidays, with the beaches only five minutes walk away and the choice of 3 good golf courses within 10 minutes drive away. The Cabo Roig Country Club with tennis, snooker pool and a family bar is 5 minutes walk away. The accommodation is situated amongst the mature gardens of the residential development and benefits from a south facing terrace overlooking the pool. Inside there is a lounge area with cable TV and feature fireplace. The holiday accommodation will comfortably sleep 4, with a sofa bed for an extra 2 if needed.